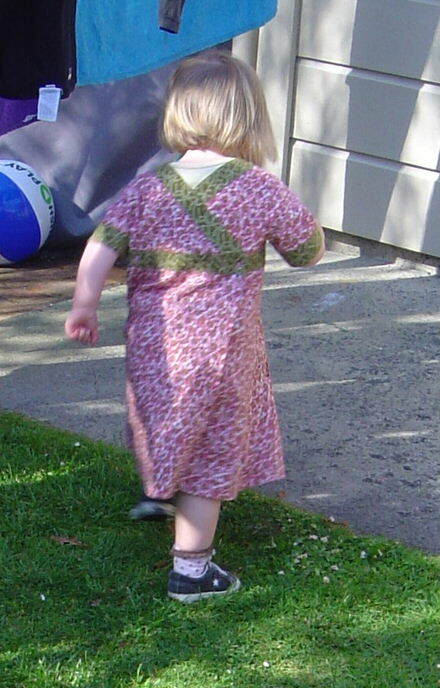 Anyway, I thought I'd start this off with pictures of Isabella in her new dress. She is a very willing model, but will do what I ask for approximately 35 milliseconds before racing off to do something else. So these are the two best shots I got. I got a lot of these! On the Hand Crafted Christmas front, I'm getting a slightly panicky feeling that Christmas is going to be here in five minutes and the twins' books will have a dozen started-but-not-finished pages and I will be pulling all nighters for a week and not enjoying the run up to Christmas at all. I think I need to write a list of what I'm going to do for each book. And finish each page before starting a new one. Um, not likely. This is probably my favourite idea so far. Maybe because it's pretty much my idea. The spark of inspiration came from a book of kids quilts which featured one with those mix-up pictures - head body and legs from different characters could be mixed up. 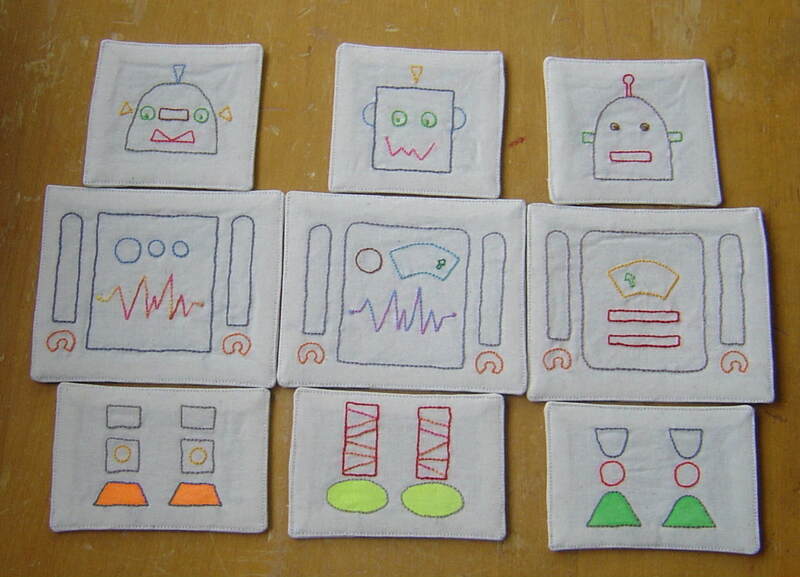 I decided robots would be fun and found a picture of cupcakes which did a similar thing (great minds and all that!) 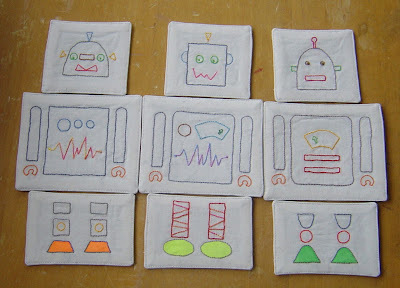 Using those for inspiration I designed my own robot stitcheries and made tags which can be interchanged to make different robots. The 9 and 10 year olds love these. We'll see what the two year old thinks! 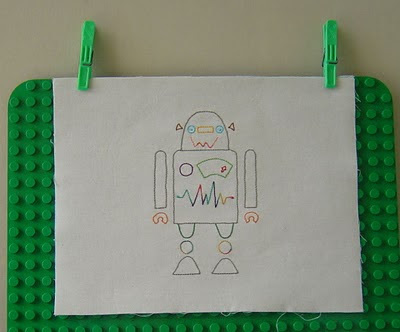 This is how the pictures are attached. I still need to add velcro tabs to hold them in place. The plastic tags are cut from template plastic and make it very easy to thread the ribbon through the slots on the back of each tag. I think Nicholas could manage this pretty easily. Whether he puts heads at the top and legs at the bottom remains to be seen. The options. So far. I don't think I'm finished yet. 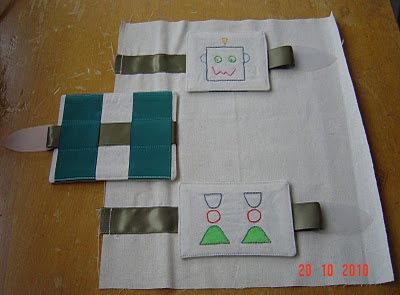 This guy is going to be the pocket which holds the extra tags. I think I like him best. Nicholas will probably like the zip on the pocket best of all. After the drama making one little horse finger puppet I found cute animal stitchery patterns and figured I'd do those on felt scraps and cut around them. 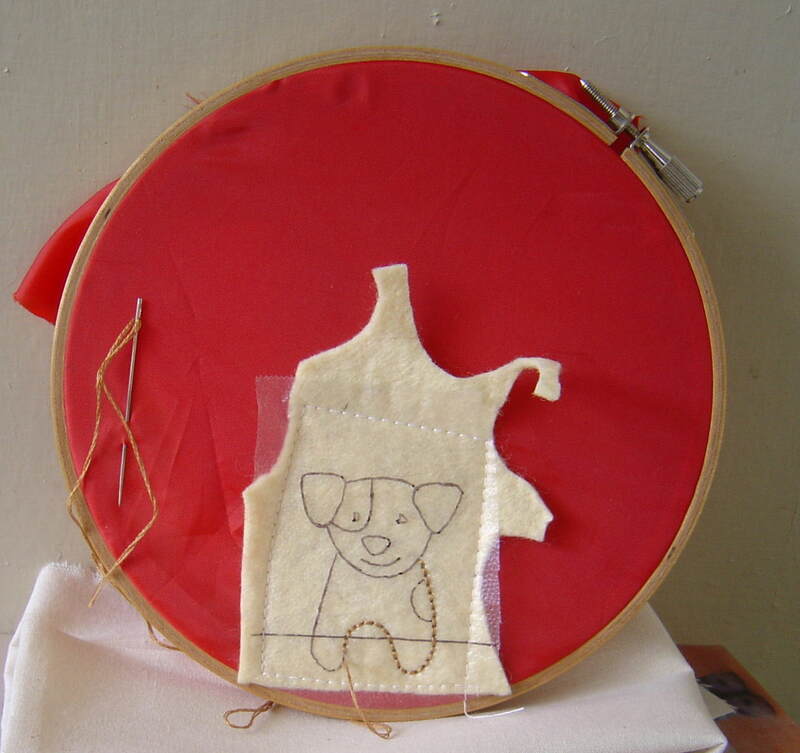 The designs are drawn onto press'n'seal which is pulled out aferwards. 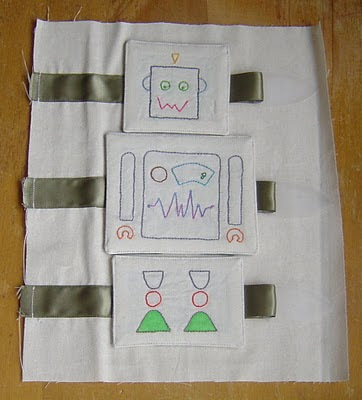 To support the felt while I stitched I sewed the felt scrap onto a fabric scrap like this. 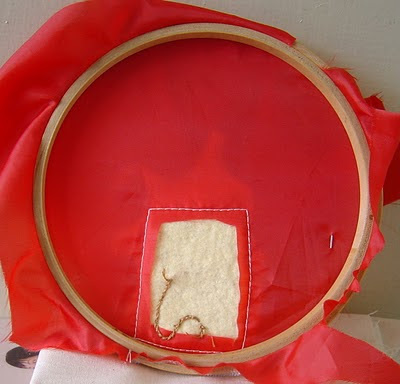 And cut (very carefully) a window behind the felt. As you see I stitched onto my backing fabric a bit, but after stitching I just cut the backing very close to the stitching and pulled it out. Sitting on my latest score from the library. Yes that's the Betty Kirke Vionnet book. Turns out the library had two copies - one for issue, one not. Oh the eye candy in that book! Now to delete the photo from computer and camera before Georgia sees it - she saw her pincushion on the camera, but since the screen is quite small she didn't see the details and I sort of dismissed it as "something that didn't work". She may have fallen for that! All cute stuff. Your daughter's dress is very pretty. I think Isabella and my Myra have a lot in common... My photos look that way, too! Or they are of her pulling off the just handmade item I'[m trying to photograph. She's still pretty adorable (Isabella, I mean! ), and good for you that they dress has a great back detail! 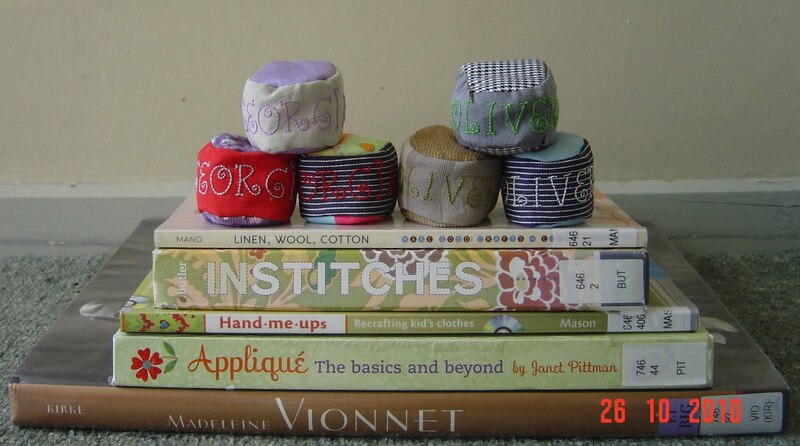 Hi Judy, I really like your blog and I wish I could sew as well as you do. We should trade blog links, we are like sister cities.